At Midwest Laundry, Inc., we focus on continuous improvement and offer our clients a "Customer Driven" approach that encompasses laundry service and incorporates our "Total Linen System Management" philosophy to meet your needs. The first step in any project we begin is to sit down with the client and find out what "you" need and want from your laundry provider. Then we tailor a program that meets those requirements. Our scope of service can be designed to control the cost of Linen Distribution, Linen Purchasing, and Linen Usage. A Linen rental program offers a reliable way to be sure you have the necessary linen inventory when you need it. Midwest Laundry supplies a dedicated inventory of standard linen items to meet your requirements. No need to worry about stock or the need to purchase additional linen. The Customer Owned Goods program offers the flexibility to purchase and maintain your own inventory. Midwest Laundry provides processing service, along with pick-up and delivery. An Exchange cart program refers to carts containing a nursing unit or ancillary department 24-hour linen par, which is prepared by Midwest Laundry to be distributed directly upon arrival at the facility. This is available for both "linen rental" or "customer owned goods" arrangements. Bulk delivery program refers to linens delivered in bulk by Midwest Laundry to a central distribution area at the facility. Distribution staff at the facility makes up carts for each nursing unit or user area. This is available for both "linen rental" and " customer owned goods" arrangements. Linen rental or customer owned goods. Pick-up and delivery service to meet your needs. All material handling for bulk or exchange cart delivery. Full compliance with JCAHO and all regulatory agencies. Ongoing evaluations and quality assurance programs. Twenty-four hour turnaround on all standard linen items. Linen distribution and Linen management programs. Linen utilization training and awareness programs. Designated Service Representative to coordinate all services to meet your needs. At Midwest Laundry, we know that our service is only as good as our people. We are confident that we have the best in the industry. With over 60 years combined experience our linen and laundry expertise, dedicated resources, and proven systems can help meet your needs and realize substantial cost savings without jeopardizing quality. Our professional staff includes people with backgrounds in laundry/linen management, management systems, industrial engineering, safety, business administration and employee training and motivation. This collection of talent assures you the highest quality of service. Of course one of the hardest decisions to make is switching providers or outsourcing away from an in-house laundry. We understand those concerns and will work side-by-side with you to make the transition as smooth as possible. A transition plan will be developed so that there is no interruption in service or supply. We can be resourceful in equipment and staffing concerns, as well. 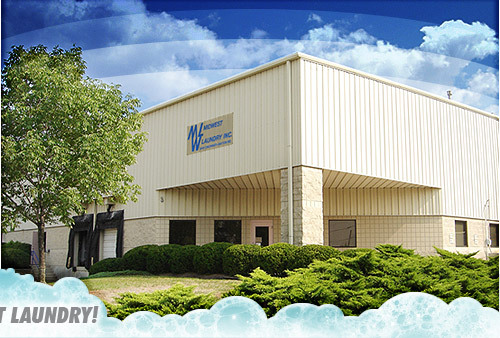 Midwest Laundry, Inc. has been a leader in textile processing since 1990, when the state-of-the-art facility was built in West Chester, OH. Built for efficiency our 35,000 sq. ft. plant operates with only the best equipment, including: two tunnel washers, ironers, folders and a computer tracking system that allows us to follow the linen as it's processed. HONESTY! No hidden charges. Do the linen invoices you receive confuse you? Are there additional charges that you didn't realize were part of the contract? At Midwest Laundry, we spell everything out upfront. We believe our customers want the process to be simple and easy to understand, so that's how we operate. SINCERITY! It's all about meeting the needs of the customer. We can't say it enough. To meet those needs, we first have to know what they are. We aren't interested in selling you what we have to offer; we're interested in offering you what you want.